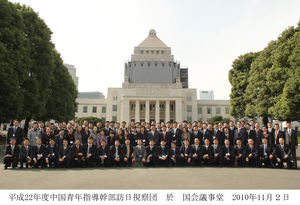 From November 1st through November 10th 2010, the Delegation of Central Party School of the Communist Party of the People’s Republic of China (hereinafter referred to as “China”), consisted of 89 people with Mr. Sun Qingjin, leader of the delegation and Vice Principal of the Central Party School, visited Japan as part of the Central Party School’s Exchange Program. JICE was in charge of managing their schedule, arranging accommodations and transportations, and dispatching interpreters. This Exchange Program started in the year 2000, so this is their 11th year. JICE has backed this program ever since it was launched. This delegation met with parties of financial and political circles while they were in Tokyo. Afterwards, they were divided into 3 groups and visited Hokkaido, Fukuoka and Hyogo Prefectures. They went on an observation tour around the organizations related to regional development, environment and governance. They also exchanged views with each party there. After visiting those regions, all groups reunited in Osaka. There, by observing firms and exchanging views, it seemed like they deepened the understanding towards Japan, and made up their minds to contribute to the development of China and strengthen ties with Japan. “The image of Japan has drastically changed after I came to Japan. I was truly surprised to know that Japan, our neighboring country, was so full of hospitality and friendliness. It was such a meaningful visit.” There were comments such as this from people who came to Japan for the first time. We are looking forward to contributing to the mutual understanding among nations through various projects that fits our catchphrase, “Connect our Knowledge, Connect to the World, Connect to our Future”. Central Party School of the Communist Party of China is a central institution for educational research which holds training programs and meetings to raise the standard of knowledge, working ability, and theories for the executives in the party (including high-ranked executives, mid-ranked executives and candidates for executives). Current principal of the school is Mr. Xi Jinping, Vice President of China. Mr. Hu Jintao, the current President of China, and Mr. Zeng Qinghong, former Vice President of China, have served as a principal of this school in the past.